Outsourcing as we’ve known it is dead. It’s not just Carillion. Your public services have also been damaged by Amey, Capita, G4S, Serco…the list goes on. These companies have failed too many times – and yet they are too big to fail. So the public takes the risk and they walk off with the profit. They get contracts, then they mess up. This needs to end. We've now stopped adding names to the pledge. Thanks to everyone who emailed your councillors and candidates. This pledge applies to services not goods. If the council needs to buy equipment, it can use the private sector. Local businesses should be prioritised in this instance. Private profit-making companies should be banned because they have the wrong incentives for service provision - they put profit for shareholders first rather than service for residents. Charities, social enterprises and cooperatives may run public services if there is a public interest case, mechanisms in place for accountability and an asset lock to protect public assets. Current procurement law does not allow a distinction between different types of organisation, but it should. Councils can use the Social Value Act, relationships with contractors and public feeling to make sure contracts are only ever made with not for profit organisations – until the law can ensure this is the case. 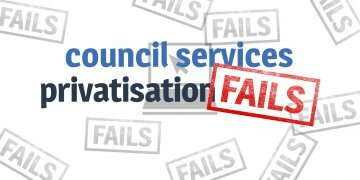 End Local Privatisation - ask your councillors to sign up! TUC report: What lessons can we learn from Carillion?